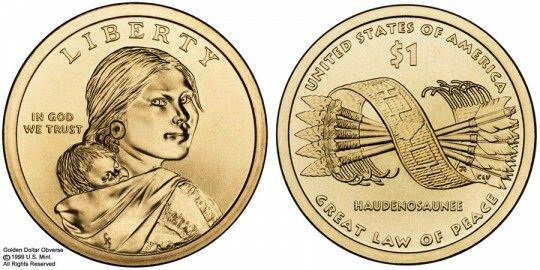 The US Mint has struck similar coins since 2000, but the 2010 Native American $1 Coin features a unique reverse as dictated by the Native American $1 Coin Act. The Act requires that the reverse of the coins should display images portraying the important contributions Native Americans have made to the history and development of the United States. These portrayals are to continue to change as long as the Presidential Dollar series runs. In order to satisfy the Act, the reverse of the 2010 coin highlights the contributions made by a group known as the Haudenosaunee (also called the Iroquois Confederacy). Established centuries ago, the group was a political and diplomatic structure banding five Native American tribes together in the New York area. 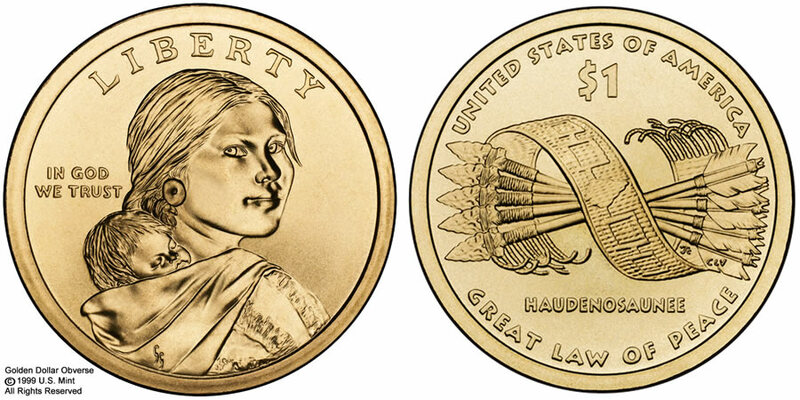 The Shoshone woman Sacagawea who accompanied explorers Lewis and Clark on the journey through the midwest and pacific northwest is featured on the obverse of the Native American coin, as she has done since 2000. Jean Baptiste Charbonneau, her infant son, is seen on her back as he was also along on the expedition. "LIBERTY" and "IN GOD WE TRUST" are shown as well. "Government - The Great Tree of Peace" is the theme for the reverse of this year's Native American dollar. It features a Hiawatha Belt with five arrows that are bound together. The belt represents the Iroquois Confederacy, a government created by five Native American tribes centuries ago. The arrows symbolize the strength of unity for the tribes. Also seen are the inscriptions "UNITED STATES OF AMERICA," "$1," "HAUDENOSAUNEE" and "GREAT LAW OF PEACE."